Ingo Siegner, born in 1965, studied history and French, spent two years in France as an au pair and as a student and trained as a bank clerk. He is an autodidact who prefers to always carry his paints with him. He has been writing and drawing for years for neighbours' children and loves to read them stories. 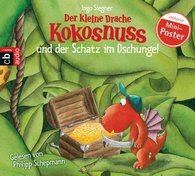 His little dragon Coconut is one of the best-known children's book characters in Germany. The books about the little fire dragon have been translated into many languages. His stories about Meerkat Gustav and Eliot and Isabella are also very popular with children. Ingo Siegner is a freelance writer and illustrator and lives with his wife in Hanover.